Tucked into the landscape, the Church of Saint George, Lalibela, Ethiopia. Ethiopian Orthodox pilgrim worshiping inside the Church of Saint George, Lalibela, Ethiopia. Carved out of volcanic sediment, the Church of Saint George’s crossed roof, Lalibela, Ethiopia. 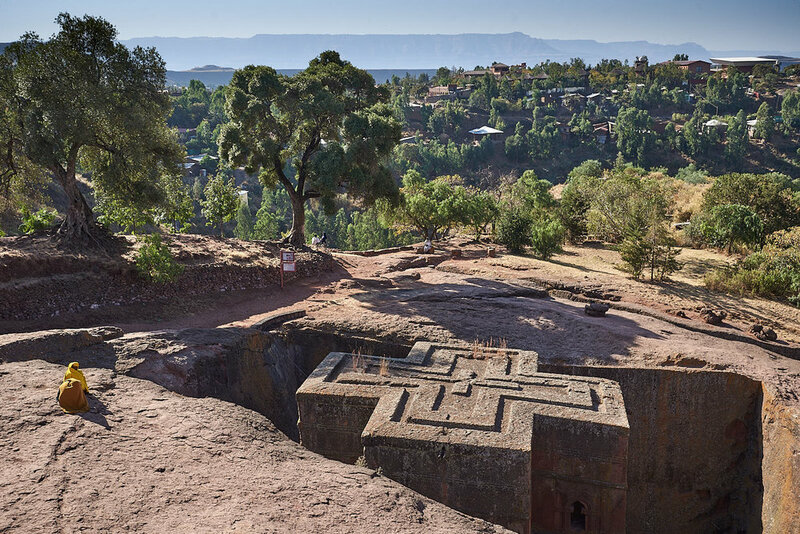 The Church of Saint George, carved out of the volcanic sediment, Lalibela, Ethiopia. Ethiopian Orthodox pilgrim at rest inside the Church of Saint George, Lalibela, Ethiopia. Ethiopian Orthodox pilgrims worshiping inside the Church of Saint George, Lalibela, Ethiopia. Ethiopian Orthodox priest on pilgrimage rests after prayers inside the Church of Saint George, Lalibela, Ethiopia. Ethiopian Orthodox pilgrim rests after prayers inside the Church of Saint George, Lalibela, Ethiopia. An Ethiopian Orthodox priest and pilgrim rest together after praying inside the Church of Saint George, Lalibela, Ethiopia.